My copy of Squeak Went the Door makes no attribution – it is printed on three pages that have been stapled together. I have had it for 30+ years. 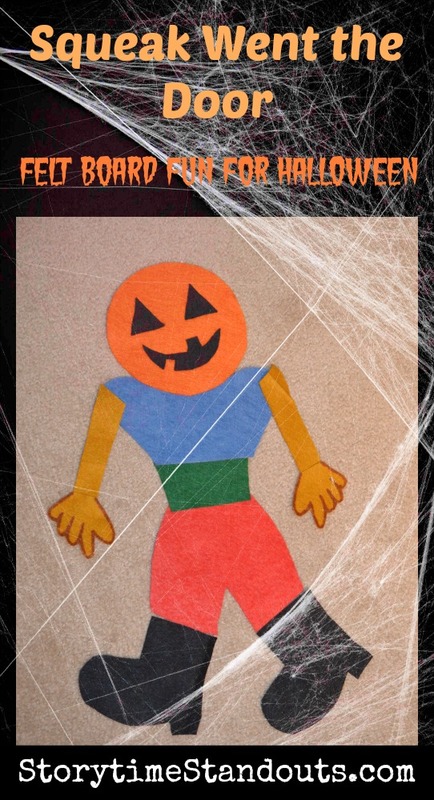 This is a fun Halloween flannel board story I used to tell at Girl Guide and Brownie Halloween events. The felt pieces I use are very plain – I should probably add some glitter glue and trim. Predictable text and a hint of suspense make this fun for prek and kindergarten. 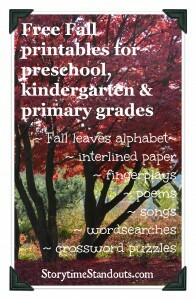 You will also be interested in our Halloween and Fall printables for preschool and kindergarten. There was an old, old lady who lived all alone in the woods, and who wanted someone to come and visit her. While she waited, she spun cloth. S-Q-U-E-A-K went the door and in came two black, black boots. They walked across the floor and then set themselves down. S-Q-U-E-A-K went the door and in came two short, short legs. They ran across the floor and then set themselves down on the black, black boots. S-Q-U-E-A-K went the door and in came a wee, wee waist. It came, bending up and down and set itself down on the short, short legs. S-Q-U-E-A-K went the door and in came two broad, broad shoulders. They lifted themselves across the room and set themselves down on the wee, wee waist. “Much walking, much walking, ” it answered. “Much running, much running, ” was the reply.